To understand why so many serious Microsoft observers were encouraged by Satya Nadella’s week-ago memo Bold Ambition and Our Core,1 it’s useful to go back 10 years and read Steve Ballmer’s 2004 memo Our Path Forward. It was around this time that cracks were first starting to appear in the Microsoft machine: the stock had been stagnant for going on four years, Windows XP was besieged by a security crisis, and Microsoft was about to announce the reboot of Windows Vista née Longhorn. Meanwhile, the iPod was exploding, and Google’s stock price had quadrupled since its IPO earlier that year on the back of its 85% share of search. Non-PC Consumer Electronics: The opportunity is virtually unlimited to integrate the richness and intelligence of the PC world with everyday devices such as mobile phones, handheld devices, home entertainment and TV. At the center of our efforts are products such as Pocket PC and Smartphone, Portable Media Center, MSTV, MSN TV, Windows Automotive, the Windows Media Center Extender, and other electronic devices built on Windows CE and Windows XP Embedded. Even here, mobile phones are only useful insomuch as they “integrate the richness and intelligence of the PC world.” Ballmer and Microsoft simply could not break free of their Windows-first mindset, and while it would be another 3 years before the iPhone arrived, it was this memo and what it represented that marked the beginning of Microsoft’s decline. It’s easy to dump on Microsoft now, but even easier to forget just how impressive and seemingly impregnable their core business once was.2 I have written multiple times that tech companies ought to be either vertically/platform focused, with software and services that differentiate hardware (like Apple), or horizontally/service focused, with the goal of offering superior software and services on all devices (like Google and Facebook). To try and do both, as Ballmer explicitly did with his “Devices and Services” strategy, is to do neither well: differentiating your devices by definition means offering an inferior service on other platforms; offering superior services everywhere means commoditizing your own devices. “Devices and Services” was nonsense. Still, it’s understandable why Ballmer thought differently: Microsoft in the 90s managed to do exactly what I just said was impossible. Because Windows was a monopoly, making their software and services work everywhere meant making them work on Windows. There was no choice between horizontal and vertical, and the company profited fabulously. Over time Microsoft added a server component to this virtuous cycle: people depended on Office, which ran on Windows, and was enhanced by services like Exchange Server, Sharepoint Server, SQL Server, etc. It didn’t matter that Office for Mac kind of stunk; that product mostly existed because of a (failed) attempt to fend off antitrust watchdogs, and it made a ton of money to boot. This cycle is why breaking up Microsoft, as Thomas Penfield Jackson originally ruled in 2000, would have been truly destructive to shareholder value. The company was strong because its products built on each other, and at the root of that strength was the Windows monopoly. Kevin Turner’s slide at WPC. Curiously, and in contrast to the rest of WPC, Microsoft has not made Turner’s keynote available publicly. A monopoly that is not. We want to go from 14% to 18%, from 18% to 25%, from 25% to 30%. That’s the beauty of this model … [the opportunity] is much bigger than anything we’ve had in the past. Turner is still talking about devices, and it’s really too bad, because the real opportunity is in the 86%. Microsoft already has software and services like Skype, Bing, and OneDrive that work right now on 100% of that pie; it’s only a matter of time until the same can be said for Office. That is the opportunity; to even think about the share of devices, particularly at the executive level, is to handicap Microsoft’s greatest chance for growth before it even truly gets started. It’s not just that Windows is no longer Office’s only market that matters; it’s that Windows and Microsoft’s devices focus is actively damaging Office’s prospects. [Microsoft’s productivity apps] will be built for other ecosystems so as people move from device to device, so will their content and the richness of their services – it’s one way we keep people, not devices, at the center. At the end of the day, look, any strategy gets eaten for lunch if you don’t have a culture that’s also changing. The problem for Nadella and Microsoft is that ultimately this wasn’t a declaration of strategy; it was a declaration of fact, and facts don’t change by fiat. This is how one can really understand why Ballmer – over the objection of Nadella, among others – made the disastrously stupid decision to buy Nokia. We now know for a fact that my speculation at the time that Nokia was about to introduce Android phones was spot-on, and the terms of the deal suggest that Nokia was having financial difficulties as well; if Microsoft would have lost Nokia, they would have lost Windows Phone, and Ballmer saw that as a mortal threat. Never mind that Windows Phone is for all-intents-and-purposes already dead; the thing about culture is that it not only eats strategy, it washes it down with a potent mixture of selective facts and undue optimism. In so doing, though, Ballmer dramatically compounded his 2004 error. When Nadella took over earlier this year Microsoft had not only missed the mobile boat, he was now saddled with a $7.2 billion dollar anchor and 34,000 new employees. That’s the thing about last week’s layoffs: even after shedding 18,000 employees Microsoft will still be about 16% bigger than they were before the acquisition, and still tightly bound to a devices group that is working at diametrically opposed goals from the software and services businesses that are Microsoft’s future. In other words, keep Windows as a cash cow, but be explicit that the future was in cross-platform services. Unfortunately, this was before the Nokia deal. The effects of that deal – and understanding why it was made – have convinced me that Microsoft cannot truly reach its potential as a services company as long as Windows and the entire devices business is in tow. In short, it’s time to break Microsoft up. The other company, the interesting company, is the services side – the productivity side, to use Nadella’s descriptor. This company would be built around Office, Azure, and Microsoft’s consumer web services including Bing5, Skype and OneDrive.6 These products don’t need Windows; they need permission to be the best regardless of device. Of course, the Windows company does need Office, and Azure, and all the other Microsoft growth engines, and this cleavage would likely hasten Windows’ decline. 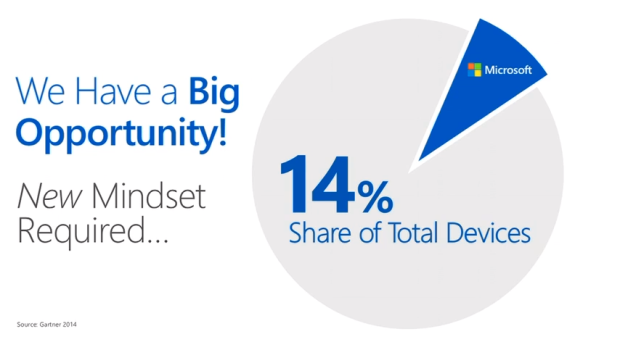 But that’s exactly why a split needs to happen: anything Office or Azure or Microsoft’s other services do to prop up Windows – that focuses on that 14% – by definition limits Microsoft’s opportunity to address the far bigger part of the pie that ought to be the future.